As much as you may love to travel, there’s a lot to keep you happy while you’re at home in our community. Clear-sky days are perfect for a poolside BBQ party, a tennis match, and practice on the putting green. Maybe you enjoy gardening or bird-watching on wooded trails. It’s all steps away at Athertyn. Year round, no matter the weather, Athertyn’s spacious Clubhouse is a glorious place for frequent get-togethers like book clubs, bridge games, and billiards as well as mixers. 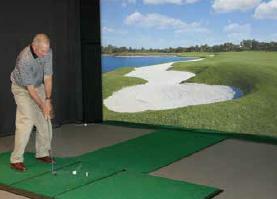 There’s even a high-definition golf simulator for practicing your swing all winter long! In a separate wing you’ll find the fully-equipped fitness center, an ideal workout room complete with lockers and showers. 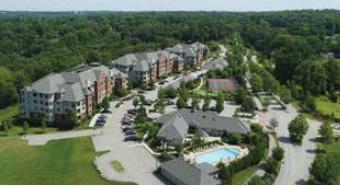 Set to break ground soon, the much-anticipated Building 6000 will have views that are both captivating and calming. Gaze from the terrace as the sun rises above stately trees filled with birdsong. Look out your windows to the sight of lush green lawns leading to a winding path through the woods of Haverford Reserve. A natural elixir! To see incredible aerial views of Athertyn captured on our new drone video, visit Athertyn.com/AerialViews.